The leader of Indigenous People of Biafra worldwide I was born in Isiama Afara, Abia State, Nigeria. His father is HRM Eze Israel Okwu Kanu (JP) and his mother is Ugoeze Nnenne Kanu. He attended Library Avenue Primary School (now part of Government House, Umuahia) and went to Government College for his secondary education. He later gained admission to the University of Nigeria Nsukka(UNN), where he could not finish due to incessant strikes before he left for London to complete his tertiary education. On October 18, 2015, it was reported that Mr Kanu had been arrested in Lagos State by Nigeria’s secret police the Department of State Services (DSS). Mr Kanu had told his solicitors that he was, on 14th October, 2015, arrested by the agents of the Federal Government of Nigeria, the State Security Service (SSS) in his hotel room i.e. Golden Tulip Essential Hotel Ikeja, Lagos State. The solicitors in a press briefing said, between 14th and 17th October, 2015 their clients whereabouts were unknown until 18th of October, 2015, when the Press Media broke the news of his arrest and detention by the SSS in Abuja. The news of the arrest of Mr Kanu generated mass protests across parts of Delta State, Enugu State, Rivers State, Cross River State, Abia State, Imo State, Lagos State, Bayelsa State, Akwa Ibom State and Anambra State. A Conservative minister said the British consular officials will visit Mr Kanu following enquiry from the activist's constituency MP, Harriet Harman. 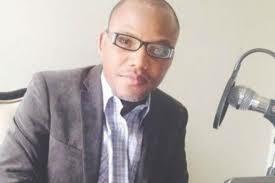 James Duddridge, Parliamentary Under-Secretary of State for Foreign and Commonwealth Affairs confirmed that Kanu, had been visited earlier by members of the Foreign and Commonwealth Office but that he did not ask for British consular assistance. The Magistrate Court 1 sitting in Abuja on November 18, 2015 ordered the Department of State Services (DSS) to produce Kanu, at the court on November 23, 2015. 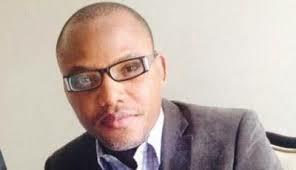 However, it was reported the Department of State Services (DSS) obtained a "secret court order to detain Nnamdi Kanu. Kanu's lawyer, Mr Obetta in an interview said whilst "in court, the prosecutor gave him a document containing a court order permitting the Department of State Services (DSS) to detain Mr Kanu for the next three months to "conclude what they said was an investigation of terrorism and terrorism financing"
Kanu was finally arraigned on November 23, 2015 in an Abuja Magistrate Court for the first time for charges of "criminal conspiracy, intimidation and membership of an illegal organisation by Nigeria's Department of State Services (DSS). They charges violate "Section 97, 97B and 397" of Nigeria's penal code. Chief Magistrate .S. Usman had at the last adjourned date, berated the Department of State Services (DSS) over its failure to produce Kanu in court on two consecutive times the matter came up before the court. Meanwhile, Kanu's supporters, stormed Nigeria's capital city of Abuja in luxury buses on a peaceful protest for their leader who was arraigned by the Federal Government before the Wuse Zone 2 Magistrate Court, Abuja on November 23, 2015. Pro-Biafra protesters with placards sang and danced outside the court premises whilst hearing proceeded. Protesters wore T-shirts and caps with inscriptions like “Biafra Now or Never”, “Buhari Release Kanu For Us”, “On Biafra We Stand”. More protests by IPOB members numbering over 15,000 grounded vehicular movements the southeastern key economic city of Onitsha concurrently. It was the same by over 20,000 protesters in Aba, Abia State on the same day. Kanu, through his counsel filed an application asking the federal authorities to transfer him from the custody of the Department of State Services (DSS) to prison. His lawyer, Obetta, insisted that transferring his client to prison would enable him have easy access to his legal team. Whilst in court, the Department of State Services (DSS) requested the Wuse Zone 2 Senior Magistrates’ Court, to discontinue the trial of Nnamdi Kanu under section 108(1) of administration of criminal justice act 2015. Mr Idakwo further said the Department of State Services (DSS) had obtained an order from the Federal High Court, Abuja, dated November 10, to detain the accused in its custody for 90 days. However, Kanu's lawyer, Mr Obetta objected the continued detention of his client. Obetta, prayed the court not to discontinue the case because the prosecution did not present any information from the Attorney-General of Nigeria Federation who had the authority to approve such. Obetta also told the court that "the DSS violated the order of the court which granted bail that was perfected but not granted, adding that the accused had been in Department of State Services(DSS) custody since he was arrested. The court's magistrate, Mr Usman Shuaibu, after listening to both counsels, adjourned the matter until December 1, 2015 for ruling.